Vegas Red Casino is closed. There are some online casinos that grab your attention the moment you land on their home page, and one such casino is Vegas Red. The brilliant red color pattern that is seen across all sections of this grabs your attention, literally, but the casino is not just about looks alone – it has the games and features to back its looks and ensure that the initial excitement does not fizzle out. The casino is available in multiple languages and offers a range of Vegas style online casino games to players. Owned by Imperial E-Club Limited, Vegas Red has a brilliant home page that stands out not just because of the blaring red background but also the superb graphics and animations. The layout complements the looks and enables easy navigation. It gives the casino a neat and spacious look that enhances your gaming experience here greatly. Vegas Red casino runs on software developed by Playtech, a respected name in the online gaming software development industry. To play at this casino, you have to download the software to your computer and register an account. You also have the option of playing directly from a browser using the Flash casino version of the software. 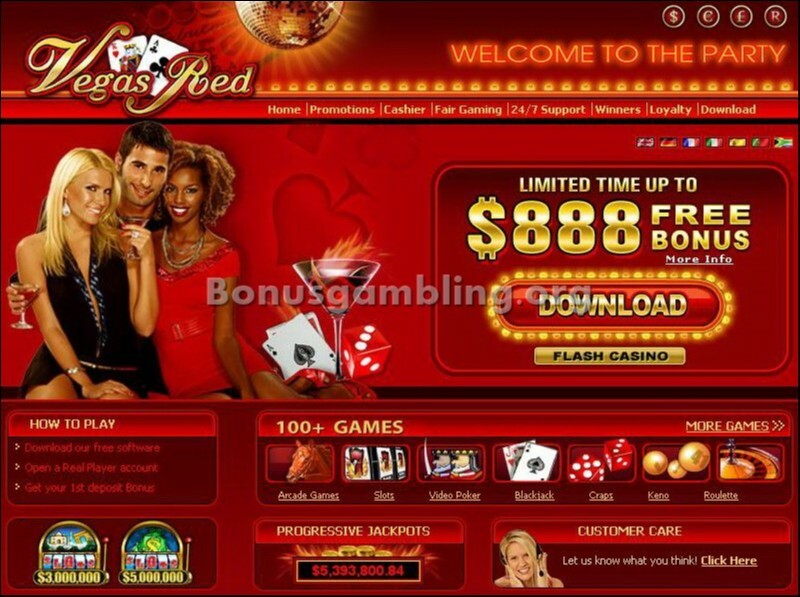 The software provides Vegas Red with some exciting features, apart from the great graphics and animations. The sound effects are on par with the best in the industry and are very realistic. Other cool features include multi-table gaming, the ability to track your transactions, multi-lingual availability, smooth functionality, easy download, complete security, and much more. At Vegas Red, you can choose from over 100 exciting games. The games available at this casino include slots (regular slots and video slots), table and card games, video poker, specialty games, arcade games, live games, Asian games, and also bonus games. There are also progressive jackpots available that you can try if you are looking to score a big win. Vegas Red provides great customer support. If you have any queries or face any problems while playing here, you can get in touch with a member of the customer support team 24x7 through telephone, fax, and e-mail. You can also check the FAQ section of the casino when you are there. Vegas Red provides a completely secure online gaming environment thanks to its use of advanced security technology like SSL encryption. All games at the casino are conducted fairly, and the casino has been certified for fairness by Technical Systems Testing (TST), a reputed independent testing and certification agency that is well-respected in the online gambling industry. Vegas Red Casino is regulated by the Directorate of Offshore Gaming of Antigua and Barbuda, like all other casinos that are owned by Imperial E-Club. This casino accepts only players above 18 years old, and US players are not welcome here.